OK – I got a good look at lunch today and some reading in on Wargames, Soldiers and Strategy, issue 67, from Karwansaray Publishers. As I mentioned Wargames Soldiers and Strategy this magazine is probably my favourite at the moment, leastwise until Miniature Wargames with Battlegames settles in to its new format. I like the mix of articles which, whilst there may be a theme running through the magazine, also includes enough general wargames content to excite and inspire. With issue 67 I found myself falling into the usual reading pattern for this magazine – start with Richard Clarke’s column “Up Front”, followed by Rick Priestley’s “This Gaming Life” and then back to the editorial. The articles will provide the lunch reading for the rest of the week. 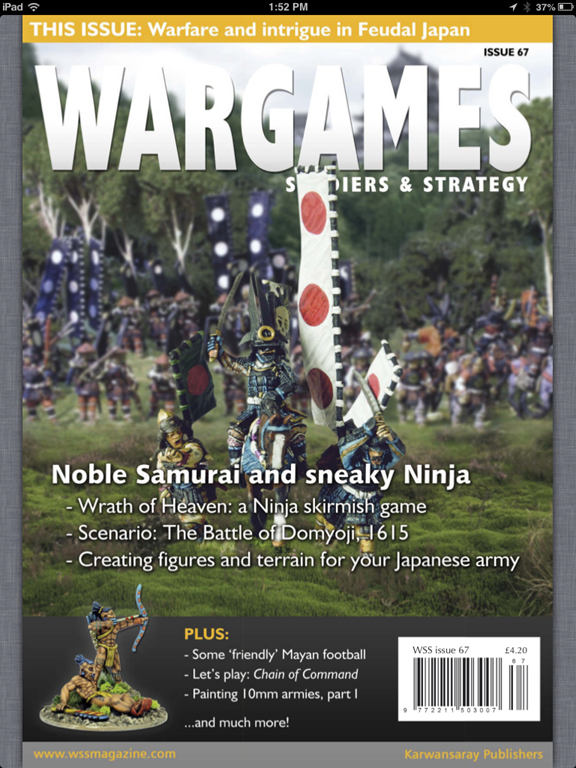 The theme for this issue is the Land of the Rising Sun – think samurai – wargaming with them, painting them, reviewing the miniatures, sort of a Samurai starter. Other articles are based on Braddock Down (English Civil War), some Victorian Science Fiction and fantasy, painting 10mm figures, Mayan gaming based around the movie Apocalypto, Chain of Command – TooFatLardies WW2 rules as well as regular reviews of books, figures, rules and boardgames. Lunch was over too soon today! I’ve been thinking of getting a copy of “I ain’t yet been shot mum”…just for skirmish type games…but sticking to the 20mm. Yeah – I like some of TooFatLardies rules – been thinking about Dux Britanniarum. Planning … just planning at this stage. Indian fleet varnished tonight – pictures to follow later.